Often we learn to cook from a book, so our eyes are fully engaged with the text, or the video if we’re copying a recipe from an online site, and our other senses are starved but if we start paying attention to our senses and use them consciously we can improve our cooking and love what we’re doing much more. By focusing on what you hear from food in an oven or a pan, you can tell how well it is cooking. You can also judge bread-making by sound. Water at a rolling boil makes a constant low rumble, while water at a simmer makes a light hiss – knowing the different sounds means you don’t have to walk to the pan to check, you can carry on doing something else, confident that you know what is happening in your saucepan. Frying mushrooms and onions hiss when first added to hot fat in a pan, but as they give off the water they contain, the sound changes to a drier, quieter sound – this tells you it’s time to give the pan a stir or shake. 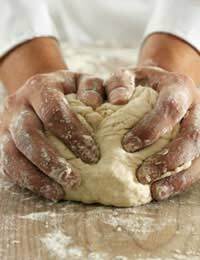 Bread dough sounds wet before it is properly kneaded, but once the gluten bonds are established, it becomes almost soundless – this helps you judge when the bread is ready to be left to rise. A fresh green bean makes a loud snap when broken, but a wetter, softer cracking noise if it is elderly. Nearly all foods smell good when fresh and bad when not – a melon or pineapple will have little or no odour when not ripe, so you can judge whether they are ready to use by their smell. On the other hand, spices and herbs lose their aroma as they age, and the loss of smell indicates a loss of taste too. You can use this to judge how much of a herb or spice to add to a dish to get the right level of seasoning. This is one of the most important cooking senses. Fish, for example, can be evaluated purely by sight – if you look at the eyes of the fish they should be clear and transparent, the longer the fish has been outside water, the more opaque the eyes become, so always pick fresh fish by their clear, wet looking eyes. Vegetables can usually be judged by sight too – bruised or rotten fruit can be spotted immediately and as they will have areas to be cut away before they can be used, it’s often not such a bargain to buy bruised items. Lifting a chicken leg away from the body and testing how well it moves is the classic way of judging if a roasted bird is cooked, but it does take quite a bit of practice, so get used to testing each bird you roast so that you can one day use this system for yourself. Cakes are done when they rise back to a gentle touch on the highest area, this saves you having to stick a knife or skewer into them. You can use a knife as an extension of your sense of touch too - asparagus stalks, broccoli and cauliflower all give strong resistance to the point of a knife when undercooked, minimal resistance when perfectly cooked – this is classed as ‘tender’ but will ‘squidge’ under the blade rather than resisting when overcooked. Taste is crucial to cooking. The way to learn about taste is to begin by evaluating the individual flavours in food that you’ve cooked – can you actually taste the saffron or tarragon or maple syrup or butter? Once you’ve got used to analysing the ingredients in cooked food, revert to the raw ingredients, if they are safe to taste, and compare their raw taste to the cooked one – this can help you with substitutions too, as it helps you learn what ingredients (like honey, maple syrup, sugar and golden syrup) taste different when raw but similar in cooked meals. Learn to taste sauces at different stages of cooking, as they can change dramatically and an overcooked sauce is one of the signs of a cook who is not using all his or her senses effectively.